I recently delivered a day of training at SQLBits and I really upped my game in terms of infrastructure for it. The resultant solution was super smooth and mitigated all the install issues and preparation for attendees. This meant we got to spend the whole day doing R, instead of troubleshooting. I’m so happy with the solution for an online R training environment that I want to share the solution, so you can take it and use it for when you need to do training. The first thing I wanted was user names and passwords for people. I wanted these preprepared and, ideally, on something with my contact info. I’d used moo before so I knew I could do up to 100 custom cards – I just needed to make them. I used the package random and the package magick to generate credentials and write them on to PDFs that could then be uploaded to moo. This goes through each line in the CSV and adds a user with a specified password. We use the mkpasswd utility here to encrypt the password. mkpasswd is part of the whois program and we’ll need that tidbit later. This needs to be done not only to give people login info but a home directory to save their stuff into. If they don’t have home directories then Rstudio throws a tantrum with them. The next bit was getting some sort of server with Rstudio installed. Dirk Eddelbuettel made a bunch of Docker containers available under the rocker brand. One of these has Rstudio server and the [tidyverse]() installed. Using this preconfigured container would mean I’d only have to add my finishing touches to it to get everything I needed. The last but one step was building my own customised Docker container that used rocker as a base, created all my users, and installed anything extra I wanted on top of the tidyverse. You can take my github repo with the Dockerfile and customise it to suit your own requirements, build it in Docker and then use it whenever you need an R training environment that can be customised to your needs and is accessible from a web browser. 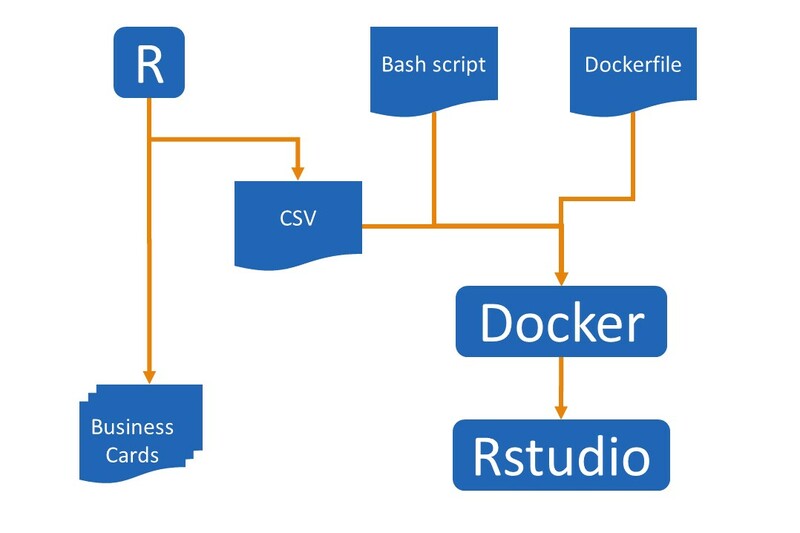 You can use it for general working environments but make sure to read my data persistence in Docker post first as the run command does not have an external volume mapped and if your host for docker crashes, everything will be lost permanently. An extra incentive to use source control maybe!